ALDS #1: Not surprised at all that Toronto manhandled Texas; look no further than the run differentials for the teams on the year (Texas was only +8, Toronto was +93). Anyone who thought that was a surprise isn’t following the games closely. The only surprise for me in that series was the fact that Odor and Bautista didn’t get into another fight. ALDS #2: On the flip side, color me shocked that Cleveland swept Boston. Cleveland is basically without its two best starters, yet still swept the AL East champ. What it tells me is that Boston’s starters aren’t nearly as good as they are reported to be, and it showed as both Porcello and Price got bombed. NLDS #1: I never expected a Chicago sweep of SF, not with Bumgarner lurking, and SF did indeed win the Bumgarner start (but without that much help from him in the end; he was in a position to take the loss in Game 3 when he departed). But nonetheless, Chicago won in four games and get three full days off before the first game of the NLCS with which to reset their rotation. A luxury that the Nats/Dodgers winner will not get. NLDS #2: Nats/Dodgers came down to game 5, and despite their chances the Nats lose another heartbreaker. Quick good links: MLB Post-season Schedule. and MLB.com’s Probable Pitchers. Here’s a preview of the NLDS. Thanks to wrapping up the NLDS early, Chicago can re-set their rotation but likely goes with the same set of arms. Game 2: 10/16 in Chicago: Clayton Kershaw versus Kyle Hendricks … i guess. Kershaw is in uncharted waters here; a win on 10/11 on 3-days rest then an inning in relief on 10/13 … I guess he’ll be ready to go for a full start on 10/16. Its definitely saying something about your SP depth when last year’s Cy Young winner is relegated to being your #3 starter in a post-season series, but such is the strength of the Chicago pitching this year. The Cubs will face a distinctly weakened LA pitching staff, shredded by the stress of the NLDS win over Washington, putting them at a severe dis-advantage. 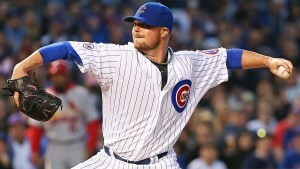 LA will be incredibly lucky to get a split in Chicago; Lester (a lefty) should dominate the Dodgers in Game 1 and then the Cubs should have their hacks against Kershaw in game 2 (Cubs 7th in the league against lefties in terms of BA). Then LA has no choice but to throw two more lefty starters in game 3 and 4, again playing more into Chicago’s strengths. This isn’t like last year when NY’s strong RHP-centric starting pitchers blew away Chicago (who don’t hit Righties as well); this is a tough matchup for LA in general. Prediction: Chicago in 5 or 6; i’m not sure it even gets back to Chicago for a game 6. A couple of interesting Nats connections here: Estrada was our 6th round pick in 2005 out of Long Beach State; he toiled in our system for years before being released and establishing himself as a superb starter elsewhere (first Milwaukee, now Toronto). Stroman was our 18th round pick in 2009 out of a NY high school; he projected as a shortstop then; he went to Duke, remade himself as a starter, and was Toronto’s 1st rounder 3 years later. The Cleveland slate of starters keeps changing; Kluber is a Cy Young candidate; he will lead off for Cleveland instead of Bauer (and, as of this 10/14/16 note, Bauer is getting pushed further due to a “Drone” injury to his finger). Meanwhile, Sanchez is probably Toronto’s best starter and Stroman was their opening day starter; I’d think both guys would get the ball before Happ. I may have to re-write this section before all is said and done. My gut feeling is that Cleveland’s superior record was attained thanks to a weaker division and the strong work of two starters (Danny Salazar and Carlos Carrasco) who are no longer there, and the step-down to Tomlin/Clevinger will cost them in the end. Meanwhile Toronto emerged from an AL East with four near-playoff quality teams and is battle tested. They had no problems going on the road to Texas and won’t either in the hitters park that is Cleveland. Toronto gets a split in Cleveland and then batters Cleveland’s #5 starters in Toronto. From there, its about what Kluber can do; can he get the series back to Cleveland? It could be a quick one. Lastly, i’m stealing this thunder from Craig Calcaterra at Hardball Talk/NBCsports.com, but this final four will award a winner who has been waiting an awful long time to win a world Series. Chicago Cubs: Last WS appearance was way back in 1945, and of course their last WS win was 1908. Dodgers: Last WS appearance and win in 1988 … in case you forgot, that series featured the epic Kirk Gibson walk-off homer in game 1. Toronto: Last WS appearance and win was the awesome Joe Carter walk-off in 1993, the year before divisional play took over. Cleveland: Last WS appearance was in 1997 (but really their big missed opportunity was losing in 1995 as a 100-44 win team), last WS win was of course in 1948. Lots of history at stake here; imagine a Cleveland-Chicago series. For the historians that’d be the best. I think the best series quality wise would be Chicago-Toronto. So, even though the team just got swept in a 4-game set, I’m not really that concerned. Why? Well, first, the Cubs are fantastic, and I thought one win out of four would have been a good, expected result. The Cubs missed Strasburg, our best guy (even if he’s not the “Ace” thanks to Scherzer‘s contract) while we stood up to the Cubs’ Ace Arrieta. The Nats scored a bunch of runs against a good team and on other days may have gotten a win or two. Am I right? Thurs: Lose 5-2: Joe Ross gives up 2 in 6 but the Nats muster just 3 hits against Kyle Hendricks. Don’t deserve to win when you only get 3 hits. 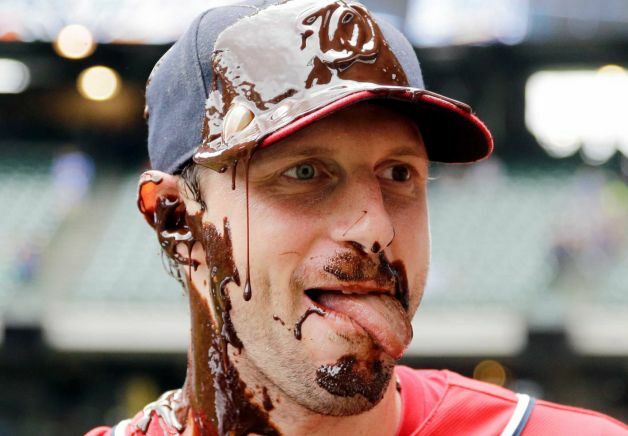 Fri: Lose 8-6 in a game that really wasn’t that close: Max Scherzer gives up four homers, which is just crazy unlucky for him based on his typical FB/HR averages. 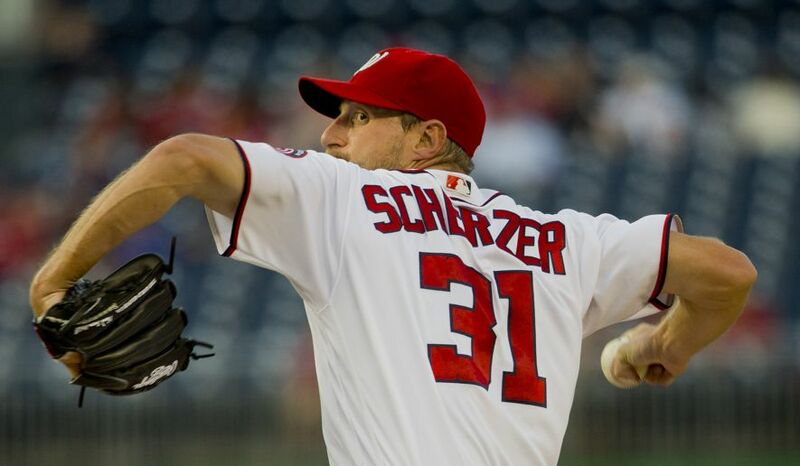 Nats make the scoreline respectable by getting into the Cubs bullpen for four runs late. Don’t deserve to win when your starter gives up 4 dingers. Sat: Lose 8-5 when Gio Gonzalez can’t get through the Cubs’ 3-4-5 hitters a third time. Nats bullpen doesn’t do its job. I kinda question the pitching management here honestly; is Solis the right guy to go to there? Is it a smart move to let your #5 starter attempt to go through the heart of the other team’s order in a hitter’s park? If you want to go lefty, why not go with your veteran Oliver Perez or your fireballer Felipe Rivero instead of a guy who was in Syracuse last week? I guess its because Rivero got blitzed thursday night. Instead Rivero comes in during garbage time and manages to load the bases and leak yet another run. Sun: Lose 4-3 in extras after chasing the best pitcher in the game and squandering a fantastic outing from Tanner Roark. Again, a leaky bullpen, this time in the same guy Perez that I thought was a better option than Solis the day before. But the story of this game was the astounding batting lines of Bryce Harper (7 plate appearances, 6 walks and a HBP) and Ryan Zimmerman (a major league record 14 runners left on base). The team in total left 21 runners on base and went 1-19 with RISP on the day. One for NINETEEN! Zimmerman hit a couple balls well on the night, but none when it counted. Total score of the series: Cubs 25, Nats 16. Lot of runs on the bullpen. Zero of our lefty relievers really stepped up. Both our 8th inning guys couldn’t shut anyone down. 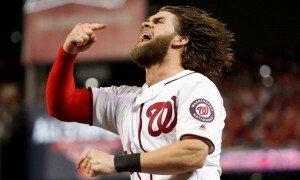 And clearly nobody respects anyone else in the lineup besides Harper. Anyway; before I get all gloom and doom, the Nats just finished their hardest road trip of the year 5-5, when prior to the season I would have been happy with them going 3-7. Thanks to sweeps in St. Louis and surprising series win in KC, i’ve still got them projected to win 95 games right now (easy math: team goes .500 against the rest of the league and interleague, plays .600 ball in their division). Now … if they get swept in New York…. (Whoops! forgot to post this on friday. I have a good excuse; it was my kid’s 3rd birthday and we have family in town. I swear I didn’t “cheat” on the Harvey prediction in game 1 from last night … and I still think the Cubs win the series). Lets get to it; this series is going to be fun. Game 4: Hammel vs Matz/Colon? Thoughts: Here’s a fun stat: The Mets went 0-7 against Chicago this year. *Winless* in seven games. 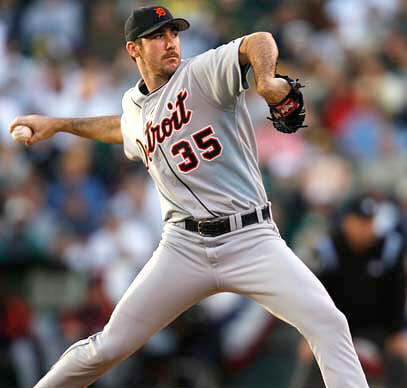 New York dodged a major bullet by only having Snydergaard have to throw one inning in the NLDS game-5 clincher; when he got up in the third to warmup, that could have blown their NLCS rotation plans (even though he apparently threw 100 pitches between the pen and the game). Now as it stands, even though the Mets havn’t announced anything their rotation for the NLCS lines up so that their three best arms each will get 2 potential starts, with their best arm (deGrom) in line for crucial game 3 and game 7 outings. I see Harvey dominating in game one behind a raucous New York crowd, Arrieta being Arrieta in game 2, then having the strategic fun start. Do you throw Matz in game 4 with Chicago’s heavy lefties or go to the veteran Colon? Can New York steal one in Chicago somehow? Maybe the deGrom game 3? I dunno; if the Cubs have already shown themselves capable of handling the Mets pitching staff, why would we think anything would change? Something just “feels” different about this Cubs team; they’re a bunch of kids on offense who have no connection to failings of yesteryear and their pitchers all made their bones primarily with others teams. I can see the Mets sneaking one or two games but think this is Chicago’s year. Prediction: Chicago in 6.